A caring funeral home that serves bereaved families in Portobello, East Edinburgh. My sisters and I cannot thank Debbie and Philip enough. From the initial contact right through to after our mums funeral we were well taken care of. They supported us every step of the way in a professional but very caring and reapectful way. Everything was perfect. Service people etc. This funeral home in Portobello is proud to be a part of Scotland’s largest independent co-operative, with a rich history spanning over 150 years. Scotmid is proud to be at the heart of the local communities it serves, with its Portobello office located in the east of Edinburgh. A car park can be found in Bridge Street, just behind the office, there is also plenty of off street parking available. Edinburgh’s seaside town of Portobello lies three miles east of the city centre. A fashionable resort in Georgian times, Portobello is now a popular residential area. They understand that arranging a funeral for someone close to you can be a difficult experience. That’s why they will guide you through everything involved, all the practicalities to planning a truly personal service that is both affordable and professional whilst offering support, care and compassion at all times. Scotmid funerals are members of the National Association of Funeral Directors (NAFD), The Funeral Planning Authority (FPA) and we’re proud to be recommended by The Good Funeral Guide, a trusted information resource for independent funeral advice. It’s been carrying out funerals since 1927 with funeral homes across Edinburgh – and beyond. They can be contacted whenever they are needed day or night. Call now for funeral care and support. I FOUND MR DAVID SHAW FROM THE PORTOBELLO BRANCH OF SCOTMID CO-OPERATIVE FUNERALS, THOROUGHLY ENGAGING,ALLOWING ME TO RELAX IN THE KNOWLEDGE THAT EVERYTHING WAS BEING ATTENDED TO. ON THE DAY OF THE FUNERAL ITSELF THE TEAM IN ATTENDANCE WERE METICULOUSLY PROFESSIONAL. QUITE SIMPLY EXEMPLARY. THANK YOU. 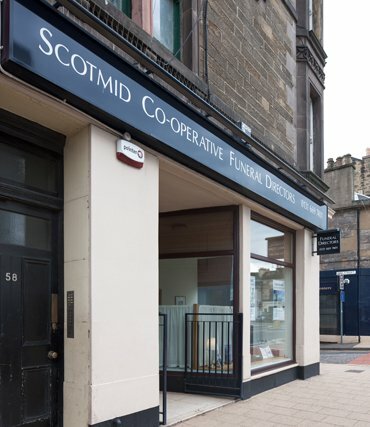 Scotmid Funerals, Portobello will provide you with a free obituary as part of their service.